Lets face it, there are very few things dogs love more than their toys (except us, of course). Not to mention, they are natural born chewers so it’s important to give them something they are allowed to chew so they don’t take it out on your favorite pair of shoes. We went out and found some of the cutest dog toys in town, 15 of them to be exact & brought them here for you to ohh & ahh over. Some for big dogs, some for small dogs – we’ve got everyone covered. For each one there is a brief description and a link to where they can be found on Amazon. For those of you who don’t know about it already Kindle, it is Amazon’s latest mobile vehicle for techie bookworms – a wireless reading device. This allows readers to access to books & websites on a lightweight device that features a special screen which reduces glare and a battery that lasts a month on one charge. 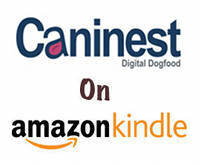 Because we want our readers to be able to enjoy dogs no matter where they are we added Caninest blog to their service for those who prefer it. The Kindle device allows users to wirelessly download hundreds of thousands of titles…not to mention the over 1.8 million out-of-copyright books that can be downloaded free of charge. We aren’t going to mention the holidays, but they are on the way no matter what we say out loud. Preparing ahead of time is the best (& cheapest) way to go so we will slyly throw ideas out there from time to time to help the process along. It doesn’t take a grown up mind to appreciate our canine friends and dog themes are popular when it comes to baby toys (& even some functional items). We’ve put together a list of baby gift ideas with a doggy theme – they’re not just for baby, mom’s to be may appreciate them as well. For each item we’ve provided a brief description & a link to where they can be purchase on Amazon. Although we are the first to admit that most animal theme jewelry is a little too, well, animal. There are also some pretty amazing jewelers who seem to have a thing for our canine friends. Here is a list of unique and interesting canine jewelry that doesn’t go overboard on the animal. From cute little paw prints charms to doggy bone rings there are a bunch of fun items here. We even found a cool way to organize it all. For each item there is a brief description and a link to where it can be found on Amazon. Here is some animal jewelry that you’ll be proud to flash in public. Most of us can’t bring our dog to work, so having canine reminders at the office can help us navigate the day until they are by our side again. Recently we’ve been sharing fun and fabulous dog theme accessories for different parts of your home & life. If you’ve missed them, be sure to check out dogs in the kitchen & the bathroom. Here is a list of fun (& functional) ways to bring a little dog to your office, each product includes a link to where it can be found on Amazon. Luckily there are all kinds of fun doggie treats you can keep on your desk – without having to worry about any shedding.